Adding automatic driveway gates to your property doesn’t just contribute to the value of your home; it’s a necessary safety consideration too. Whilst they can definitely complete the look of your home and boost your property’s kerb appeal, they also provide a vital first line of defence. We check out the reasons why automatic gates are one of the safest solutions for you, your family and your home. Automatic gates offer peace of mind for homeowners living by themselves and families with kids by increasing the level of security around your home. Through the use of monitoring systems and access control, you can limit who enters your property and who doesn’t. For homes with pets and children, the security of automatic gates is irreplaceable. Just as effective as automatic gates are at keeping strangers out, they also keep young children and pets inside the property where it’s safer and a more controlled environment. The recent tragic event in Perth that was well documented in the media is just an example of how quickly and easily a child can wander out of the home and into harm’s way. In addition to the extra level of security, installing driveway gates can encourage more privacy for you and your family away from prying eyes. 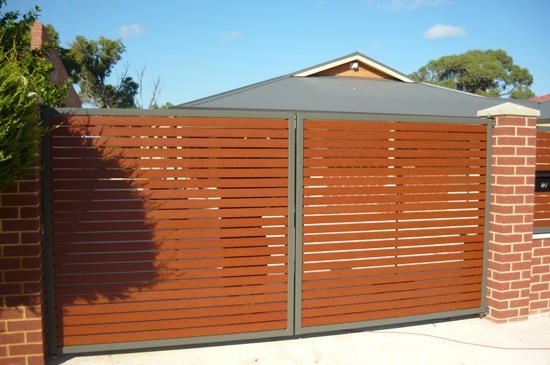 Automatic gates can be designed in narrow slats, making it harder for people to see into your property and personal lives. These days, safety and comfort go hand-in-hand and homeowners want something that’s not only secure but practical too. For homes that are situated on busier streets, the convenience of not having to leave your car to open driveways gates is significantly beneficial. With automated driveway gates the level of comfort is lifted for homeowners and families. By a simple swipe of a card or press of a button, you’re in the safety of your own home without needing to get in and out of your car. For shift workers needing to come and go at late hours or parents with children this is extremely valuable. Leaving a child unattended in the car, even if it’s just for a moment to get out and open the gates can result in them trying to touch the gear stick or car controls, or leave the car themselves to follow. With the safety and convenience of automated driveway gates, you won’t need to worry about leaving your children in the car or leaving the safety of your vehicle late at night. With statistics on the rise about the safety of children so close to the home, it has become even more crucial for parents and homeowners to consider driveways gates. Sadly, every week in Australia one child – normally a toddler – is run over in the driveway in his or her own home. In the bid to cut down the number of fatal driveway accidents, it is encouraged that homeowners install child-resistant fencing and self-closing gates and driveways gates at their home. Reliable and secure driveways gates can help to ensure young children cannot wander onto busy streets or into the neighbourhood. In addition, you should always make sure your children don’t use the driveway as a play area. By creating other ‘safe play areas’ for young children, you’re able to separate the use of the driveway and play spaces to reduce the likelihood of them being in any danger. Because automatic driveway gates are just that – automatic – homeowners have questions about their practically during power outages. In the event of an emergency, automatic driveway gates have a backup battery should electricity fail. Solar powered gates are also a good option for this reason. However – technology can be fickle and understandably some people worry that unforeseen circumstances (maybe a mouse chews through your cables!) could leave you stuck inside or outside your gates at some stage in the future. That’s why when choosing your automatic gates supplier, it’s important you go with a company you can rely on. One that will come to your aid should something stop working. At Fencemakers, we have guaranteed ongoing support for our customers. If something should go wrong you’re your automatic gates our staff are just a phone call away and always willing to do everything we can to ensure you’re able to comfortably leave and enter your home as normal. Ask us about our automatic driveway gates today, or book a free quote online!